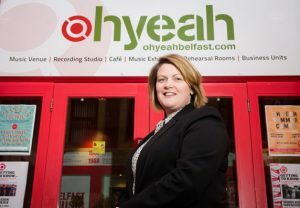 In June, it will be 10 years since Charlotte Dryden started working in Belfast’s Oh Yeah music centre. 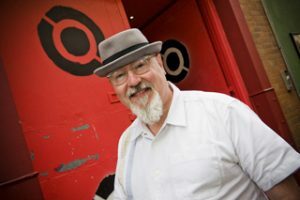 She and the founder Stuart Bailie began on the same day, although Stu had been driving the project since early 2006 and doors opened to music in 2007. Charlotte’s now the Chief Executive of this remarkable organisation which manages a careful balance between celebrating the history of music from Northern Ireland and developing new music, young musicians and music business talent. Stuart has moved on and we’ll be hearing from him on the next episode. 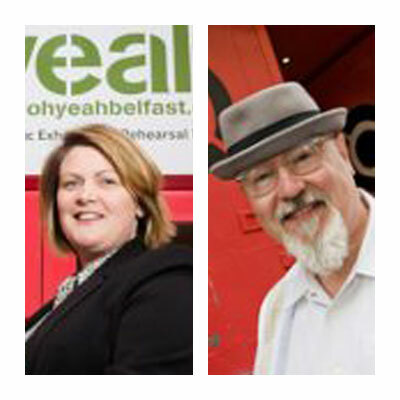 The Oh Yeah building in the cobbled streets of Belfast’s Cathedral Quarter once a warehouse – is now an exhibition, performance space, a recording studio, offices from where people promoting music business work. And there’s a bar and cafe. As well as music events, Oh Yeah runs courses for talent development, music business development, youth outreach and a whole lot more. And it ain’t just for kids. Paul Kane is the Outreach Development Officer – one of his jobs is to manage the Older People’s Project. He joined Charlotte and me in the David McWilliams room to look back over 10 years and to look forward. The Oh Yeah website has plenty of information about what’s going on in the centre. And if you were a female punk you might want to get in contact with them and tell your story. I’m Davy Sims – you can find me on Facebook and Twitter and all the usual places. October 17, 2017 and Hand Models are blasting out of BBC Radio 1 and the Huw Stephens Show. The song is ‘Skate Shoes’ and it fits the playlist with tremendous ease. A crunching intro, guitars that wail and soar plus Gareth’s admirable drawl. The lyric is about an untouchably cool girl in her Vans sneakers who causes the Belfast boys to swoon and to lay all of the flowers from Ormeau Park at her feet. Sigh. Hand Models began in Armagh with Gareth, later introducing Brendy, sometime bassist with Let Go Dive. Many drummers were tested and found wanting. After relocating to Belfast, they encountered Richard, who was previously in the band January. They were searching out the internet one evening when they came across Peter’s Soundcloud page. He was from Strabane, had similar tastes in music and previous form with the act Freaks. They sent him a message and presently he was in. The false starts and deliberations were over and 2017 saw fierce shows and early releases, ‘TV Kids’ and ‘Sun Rooms’. The latter was also a Huw Stephens play. “Nothing’s ever been difficult for this band because we’re all singing from the same page,” says Gareth. They are avid students of songs that may sound simple but are expertly constructed. Gareth got his musical education in his early teens when he heard ‘Monkey Gone To Heaven’ by The Pixies and his imagination was lit. Pavement and Smashing Pumpkins were soon revealed and now artists like Wavves also supply encouragement and style. “We’re not gonna overwhelm ourselves with plans,” Gareth figures. Don’t believe the nonchalance though: Hand Models are potentially super models. Reevah is an artist from Derry with an impressive voice and songs that stretch out of the material world into another, entrancing zone. She mentions with a smile that “dreamy folk is what I’m going for”. Her music has featured on BBC stations such as Stephen McCauley on Radio Foyle plus Across The Line on Radio Ulster. In October 2017 she travelled to Warsaw, Poland for a performance at the PROM Kultury venue. Songs such a ‘Nights’ and ‘Daydreamer’ are beginning to register beyond Ireland. “I’ve grown up with music and art throughout my whole life,” she says. Her mother is an artist and so she has witnessed exhibitions, bold ideas and fresh expressions. Her father is a musician and it was no surprise that she would pick up an acoustic guitar at the age of 13. At the same time, Reevah was introduced to Van Morrison and the indefinable beauty of his ‘Astral Weeks’ album. She also learnt how to play violin, piano and drums. She sang in a choir and tested her mettle at the Derry Féis. She took a degree in music at Magee College, where she started to find a voice. There were open mic sessions and the obligatory cover versions before a slot at the Sandino’s in early 2016. There was a determination to make an impression and thus she wrote a set of original songs in two months. This was also the moment Aoife Boyle created her alter ego, adopting the name of an acquaintance in Boston. “One of my dads friends was called Reevah. As a teenager I always thought, she’s really cool. And I’ve never met another Reevah since then. Now it starts to feel like a different person. Aoife is the one who works part-time and gets on with her day-to-day life. Reevah is the one that goes out and plays. She rates Dallas Green, Lucy Rose and Bon Iver as exceptional voices. Her songs, she figures, are like “an ongoing diary”. Expect tremendous updates, soon. Strange New Places is a story about good humour and queer punk, untold stories, neurotic fizz and the 261 bus from Enniskillen to Belfast. Strange New Places is five intelligent people, variously displaced and collectively great. They may be sited on the cultural margins but it takes little imagination to put them in the centre of some other, evolving ideal. Ash Jones sings and plays guitar and writes many of the lyrics. Brother Rory plays keyboards and Michael Smith also plays guitar. These three featured in a little-known Enniskillen act that performed cover versions and made spoof music videos. They relocated to Belfast and Ash caught the attention of Emer McGuckian at a poetry night in late 2015 when she read the words to a Los Campesinos! song, ‘The Sea Is A Good Place To Think Of The Future’. It was memorable. “You wore a great cardigan,” Emer recalls. “I was also in the point of coming out at this point,” says Ash. They played an anarchist bookshop event to three people, including two organisers. They featured in an Outburst Queer Arts Festival event with the non-binary performance poet, Alok Vaid-Menon. Meantime great songs were emerging, like ‘Coraline’ and ‘Trombone’ – the latter was recorded for the ‘Scratch’ programme at the Oh Yeah Music Centre and premiered by Tom Robinson on BBC 6 Music. ‘Sappho & Star Wars’ was written, “partly to celebrate lesbianism, and partly like, I am a girlfriend as well”. Cut In Blinks is a Belfast-based electronic act, the work of Neil Hughes. The music reaches into immense atmospheres and sentiments. Sometimes there are vocals and otherwise there are samples, guitar and Moogs. This is an artist that is intrigued by the flickering of a fluorescent tube, by random weather incidents and found sound. The name Cut In Blinks is a reference to Shakespeare – about concepts of time, meaning and perception. This translates well into Logic Pro software and the unique workings of an artist who was raised in Newtownhamilton, Armagh, beside the Fane River and surrounded by the Mourne Mountains. There were various musical excursions before 2016 but in December of that year there was significant track called ‘Sad Love’. It was a slow-burning expression with a deal of human release and the rumble of post-rock. It was played on BBC Radio Ulster and it later transpired that the piece was about bereavement, “a mix of sadness and a deep love for that person”. Cut In Blinks is impressed by the film soundtracks of Hans Zimmer and there’s every likelihood of the music following suit. Another meaningful connection is to the pioneering work of the London artist Burial, particularly the 2007 album ‘Untrue’. “I was obsessed with that album for a good year. It was a strange record and so unlike all the dance music I’d heard up until that point. It just felt really earthy and human compared to the four-to-the-floor stuff. Quite an emotional album.” And it was a gateway into other sonic composers: “Four Tet, Aphex Twin, dark ambient, noise music. I went really hard into the rabbit hole. I’m just slightly trying to crawl back out of it now”. Further varieties of Cut In Blinks were revealed in a mini-album, ‘In The Mouth of Sandbanks’, released in March 2017. Two of the tracks featured Pixie Saytar, an American artist based in Belfast who collaborated on the tracks ‘Sinking’ and ‘Taste’. This was another breakthrough. “I went to Pixie with songs, lyrics, everything. She took the songs and changed lyrics and switched up the melodies and vocal rhythms. I really enjoy working with singer songwriters”. Mood is paramount. Expectation is high. Cut In Blinks is close to the edit.